I love sparrows. However there was a time when it was more of a love/hate relationship. As with all beginning birders we tend to look at sparrows and shrug our shoulders with uncertainty as to which species it is we’re looking at. And this type of behavior is perfectly normal when you’re looking at these little brown birds. They all look alike. And it wasn’t until I started birding with Jon on a regular basis that it all changed to a love affair with these little brown birds. Last time I counted there’s about 36 species of birds with the word “sparrow” in its’ name listed for North America. 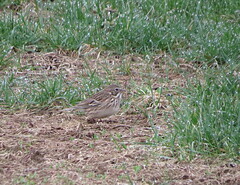 And for the most part they all have that overall brown appearance, with the exception of the Olive Sparrow. Sizes do vary somewhat, from the tiny 5″ Nelson’s Sparrow, to the beefy 7.5″ monster Harris’s Sparrow. Habitats where you find sparrows differ as much as the species itself. From ocean shore, the great plains, and the desert southwest, sparrows can be found all over North America. 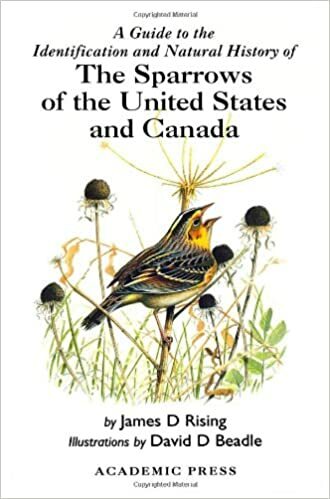 Jon turned me onto this book several years ago, and after I bought it, it’s become a valuable resource whenever I need to brush up on sparrows. Now the ones I enjoy chasing down the most are our seasonal or migratory sparrows. 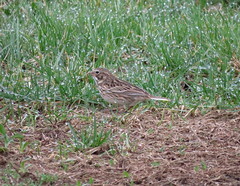 In the fall I love to chase Nelson’s and LeConte’s Sparrows in the grassland parks of central Ohio. 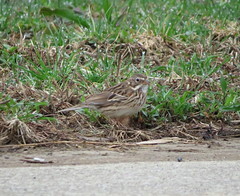 In the spring and summer Henslow’s Sparrows can be found even my neck of Ohio. And in the winter my thoughts always turn to Fox Sparrows. In the eastern half of North America these beautifully marked sparrows can be a challenge since this part of Ohio is at the birds northern most range in the winter. I feel they’re an uncommon bird for the winter, whereas the American Tree Sparrow is everywhere during our colder months. But they can be found, and one Fox Sparrow in particular has been giving good views at Armleder Park. So while my wife was off hiking with her hiking club at California Woods ( my go-to spot for Northern Waterthrush ) I made my way over to a quiet corner of Armleder park in search of a Fox Sparrow. It’s been a couple of years since I’ve had a decent view of this species, let alone get a photograph. Heavy rains the night before kept the birds quiet for the first 30 minutes I was there. Then they all started to wake up. First the Eastern Towhees started to call. White-crowned Sparrows were busy feeding in the underbrush, until I “pished” them out. Then a White-throated Sparrow joined in. But no Fox Sparrow. I grew weary and wandered off to try another location. Then I noticed this other birder looking hard at something, but what? I followed his stare and saw some birds in this small tree. One thing I’ve learned from years of birding is to always find out out what others are looking at. Most of the time it could very well be a common bird, but there is is always that one time where it might be something good. My intuition paid off and I was able to get onto this beautiful Fox Sparrow. I took loads of pictures, but this one I feel is the best. When I said beautifully marked, I wasn’t kidding. This is a stunning bird. On this Valentine’s Day while my wife is out relieving the everyday stresses of work with a massage, I’m having a wonderful time doing some feeder watching this weekend. As much as I love to get out into the field and do some serious birding, sometimes it can be athrill when you just sit there after filling all your feeders and seeing what appeaars in your yard. February can be a pretty lean month as food supplies dwindle and birds become bolder around feeders. House Sparrows and White-throated Sparrows fight over seed scattered on the ground, while Starlings hang out under the suet feeder waiting for scraps that are dropped. Surprises like a Red-winged Blackbird ( where were you in January) Common Grackle, and a American Crow are always a welcome sight. Woodpeckers are always fun as they try to muscle their way to the suet. With feeding in both my front and back yard there is always some action close by. Keeping the feeders filled is always a challenge when you work. If you forget just one day the feeders could be emptied and no birds around to watch. Granted I’m never thrilled with the Starlings taking over the feeders, but there is usually enough for all the others. As Spring slowly approaches the feeders will be removed as the birds start to find food on their own, but as long as the bitter cold sticks around I’ll be out every couple of days filling them up. Well January is finally, and mercifully over for this valiant birder. For my last day in January I wanted to try Cowen Lake State Park and see if any new ducks were there. Well the lake is still frozen over and except for a patch of some Canadian Geese and a couple lone Bald eagles sitting on the ice, the park was a big bust when it came to new birds. It was while I was about to change location when Jon called me and said he was on his way to Caesar Creek and wanted to know if I’d meet him. “Sure, why not”. We met up and after several hours of driving around I was able to tick off 2 more birds for my January list, which now gives me a grand total of 70 birds. Not very good considering the birds I missed, which I shouldn’t have. Well there’s always next year, just like the Red’s.